The # 1 Buyer and Seller of Old Stock Certificates on the Internet! With a name like Scripophily.com we have to be Good!!! Bob Kerstein is making a killing in the stock market. He just bought a stock that could net him $4,500 in one day. While he may very well sell it tomorrow, Kerstein is no day trader. In fact, few of the stocks he trades are listed on any of the major exchanges. The particular stock in question was issued in 1922 by Houdini Motion Pictures and signed by none other than Harry Houdini himself. Houdini's venture has long since disappeared, and along with it any hope of redeeming the certificate for even its face value of $10. But to Kerstein and a growing number of others who dabble in the art of collecting and trading old stocks and bonds -- known as "scripophily" (pronounced scrip-awfully) -- the Houdini certificate is rare and priceless. Kerstein, 47, and his wife, Susana, 45, are the curators of Scripophily.com http://scripophily.com, a trading place for once highflying stocks and bonds that eventually cratered. 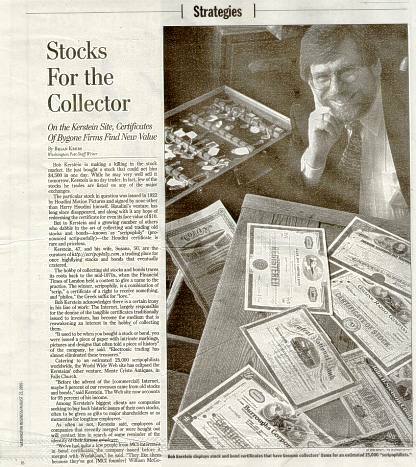 The hobby of collecting old stocks and bonds traces its roots back to the mid-1970s, when the Financial Times of London held a contest to give a name to the practice. The winner, scripophily, is a combination of "scrip," a certificate of a right to receive something, and "philos," the Greek suffix for "love." Bob Kerstein acknowledges there is a certain irony in his line of work: The Internet, largely responsible for the demise of the tangible certificates traditionally issued to investors, has become the medium that is reawakening an interest in the hobby of collecting them. "It used to be when you bought a stock or bond, you were issued a piece of paper with intricate markings, pictures and designs that often told a piece of history" of the company, he said. "Electronic trading has almost eliminated these treasures." Catering to an estimated 25,000 scripophilists worldwide, the World Wide Web site has eclipsed the Kersteins' other venture, Monte Cristo Antiques, in Falls Church. "Before the advent of the [commercial] Internet, maybe 3 percent of our revenues came from old stocks and bonds," said Kerstein. The Web site now accounts for 95 percent of his income. Among Kerstein's biggest clients are companies seeking to buy back historic issues of their own stocks, often to be given as gifts to major shareholders or as mementos for longtime employees. As often as not, Kerstein said, employees of companies that recently merged or were bought out will contact him in search of some reminder of the identity of their former employer. "We've had quite a few people from MCI interested in bond certificates the company issued before it merged with WorldCom," he said. "They like them because they've got [MCI founder] William McGowan's signature on it." Kerstein's certificate collection began as a byproduct of his interest in Civil War memorabilia, particularly Confederate war bonds. He stumbled upon the remainder of his early collection searching for antiques and furniture at various estate sales and auctions. Since then he has become known as something of an authority in the business, and because of his Web site, Kerstein says he has just about as many inquiries from buyers as from sellers. A certified public accountant by trade, Bob Kerstein served as chief financial officer for several telecommunications companies -- including McCaw Cellular Corp. and American Mobile Satellite Corp. -- before striking out on his own. Having endured countless hours on cross-country road shows raising investment funds for American Mobile before the company went public, Kerstein said he feels a certain solidarity with the early business pioneers whose stock he now sells. "It's amazing to think of all they had to go through to raise money," he said. "We visited 30 cities in a few weeks. A hundred years ago by stagecoach or railroad, that must have taken many months." All but a handful of the more than 1,000 different stocks and bonds Kerstein sells have no monetary value, meaning they were either cashed in, canceled by the company, or that the company that issued them went out of business. Yet, Pierre Bonneau, chief executive officer of Stock Search International, estimates that 20 percent of old stocks and bonds still hold some investment value, even if the company that originally issued the certificate no longer exists. For $85, Stock Search will research a certificate, determine whether it still has investment value, and try to collect money from that company. Stock Search keeps 30 percent of any funds recovered. Bonneau said too many people believe that an issue loses its redemptive value once it ceases to be traded on an exchange. "What we're dealing with in many cases is a form of miscommunication," he said. "On one side, corporations change their names, merge or are bought out. On the other side, we also know that the average American moves every five years. At the point where the two bubbles don't reach, we have an orphan." Bonneau cited the infamous Investors Overseas Services Ltd. Founded by Bernard Cornfeld, Geneva-based IOS was a prosperous 1960s mutual fund that collapsed when its controlling shareholder, Robert Vesco, fled the country with $224 million of the company's money. "Fund holders became convinced that there was nothing left for anyone," he said. "But to this day there are millions of dollars owed to fund holders still waiting to be claimed." Kerstein said his site also offers resources and tips for certificate holders conducting their own research, but cautions that even at the end of a successful search, convincing companies to cough up the money can be difficult. "It's a fairly cumbersome process," he said. "It's not unusual for people to get stonewalled by these companies." Over the past year, Kerstein has sold at least 400 certificates a month, for an average of $40 each. Sales have soared since he put a number of them up for bidding on several Internet auction sites. Last year's profits from the Web site -- about $70,000 -- have dwarfed the amount the antique store earns in any given year. The store, however, is far more productive than the Kersteins' other property -- the Monte Cristo Gold Mine, a long-dormant series of hollow veins coursing beneath 22 acres of California brush in the Angeles National Forest. Steeped in legend and broken dreams, the old mine fits nicely into Bob Kerstein's reliquary. He jokingly compares investors flocking to Internet start-ups to the speculators in the California Gold Rush of the mid-1800s. "Investors are throwing money at these companies, but how many will be around in 100 years? Let's face it: Most of them won't, and without even an old stock certificate hanging on the wall to remember them by." ........and we have a selection of more ranging from $10 to $1000.